Below is the composition of my complete investment portfolio at cost since I started earning. This portfolio will change over time as and when I deem fit. Aside from stocks, I consider cash, property, CPF, SRS, precious metals, insurance-investment-linked-product as my part of my investment portfolio since these are components that can potentially earn tangible returns. Every cent here is from my own hard-earned money with no external support whatsoever. Property - Includes down payments, installments, stamp duties, first time renovations and furniture expenses. All recorded as cost and excludes capital appreciation. It also excludes my wife’s portion of payments. CPF & SRS - Includes current balance of CPF not wiped out for my properties & SRS. 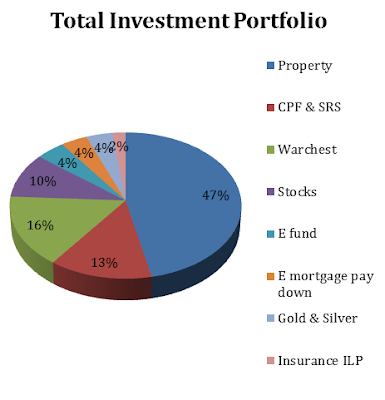 It also includes CPF and SRS used for investments in stocks and funds. Warchest - Cash waiting to be deployed when stock market is beaten. Stocks - Excludes stocks bought from SRS. Emergency mortgage pay down - Cash to be used for paying down home loan if interest rate increase. Emergency fund - Cash or liquid bonds such as SSB to last approx. 5-6 months of expenses. I did not consider the worst situation that both my wife and myself are out of job. The reason being if that really happens, I am still able to utilize my cash labeled as warchest and mortgage pay down as E fund expenses. Or worst scenario of all, I can also liquidate my equity or gold and silver. Gold & Silver - Cash waiting to buy gold and silver as appropriately. I think setting aside at least 10% of portfolio of cash and stocks in precious metals as an hedge against inflation make sense. Insurance Investment linked product (ILP) – Sum of total monthly amount spent on insurance and ILP since day one. I first started buying ILP since 1997 when I was completely ignorant about financial literacy. Bonds - I will also be looking to add high grade corporate bonds into my portfolio in time to come. Meanwhile, I had applied for SSB, but it is classified under my E fund. To me, money spend on intangible investments can be considered even more important. This includes money spent on health, family members, friends, relatives, hobbies, leisure, entertainment, tour etc. This is because life isn’t only about tangible returns. Refer to my 5 sets of priorities in life here. Looking to trim down my warchest to 25-30% of my stocks, cash, precious metals portfolio as appropriate. But I will be patient. Good investing is boring - George Soros! only cpf, equity, war chest, investment link product, saving plan( this one we bought when i was completely ignorant ) , unit trust( bought long time ago) emergency fund. Forget about the tangible investment for now. Do something else and continue to build up our strong character and mind, for that matters more than the actual nitty gritty skills of investment. Use this Correction to reap the future! I'm currently buying Sprott Physical Silver Trust. May I know how you intend to purchase your gold and silver? I was thinking to use UOB account for silver and maybe buy physical gold coin. This is because in a trust or account, the Ag Au we trades are actually lesser than the physical around in the world. Therefore when there is a hyperinflation due to currently devaluation, the price for physical gold may even be higher than paper gold. Why do u go for the Sprott silver trust then? U reckon silver is better than gold? Thanks for sharing. I have thought of UOB gold and silver savings account but I have to buy in X quantity to make it worth the admin fee. I prefer Silver to Gold because silver has more uses and its cheaper too. I agree with you. And also Gold/Silver ratio is still consider high historically. Looks like not only you have all your investment portfolio straightened out but also your mindset planned very very well. Thanks. Yeah I like to plan my stuffs properly. It always help for me and let me feels confident and even happy. To be honest I am not entirely concern about how my portfolio is doing now. What I more concern is am I improving each day mentally, and as a person. 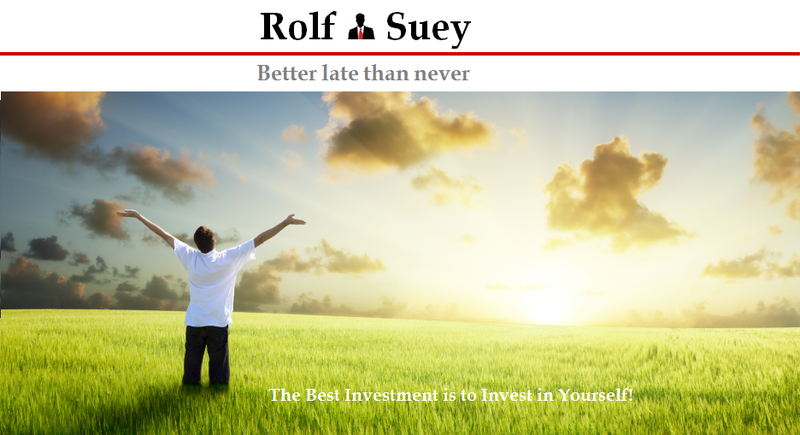 The best thing I learn about investment so far is not the money returns. The best thing of investment is the application it has in life! That is great! Read, write invest and keep failing and learning and evolving. That's absolutely great for me! Great diverse portfolio! 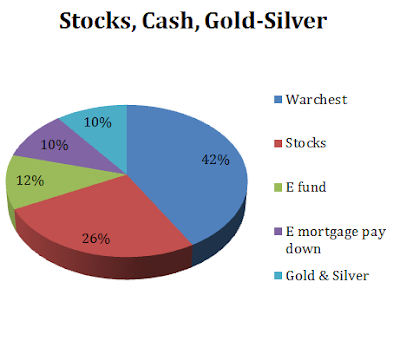 How is your return of precious metals compared to stocks? I am not happy with the portfolio, I need to continue to fine tune it. For metals, I am still waiting at the side, since I will probably need to go to the bank to resolve it. But I had been quite busy lately to be able to do that. I want to actually. But amount is not big and its not just the money. Buying from my agent since 1997 makes it more difficult to sell from a personal relationship perspective!